The 28th edition of the cosiest festival in The Netherlands was again a big success; 30,000 people visited the venue and the Saturday with Crowded House, Mick Hucknall and Carlos Santana was the most crowded day. Bospop 2008 started on Friday with good old “southern” guitar rocker Neil Young. The fans had to wait very long - in the pouring rain - to enjoy Young’s heavy guitar rockers and his more sophisticated acoustic country songs. This is the first time ever that Neil Young played in this part of The Netherlands and the always rather moody Canadian seemed to be in a good mood this evening. When the first chords of “Powderfinger” hit the Bospopaudience even the sky turns bright…. Young’s guitar solos are still a treat to my ears and I am pleased that he decided to come up with a set list of rather heavy guitar songs and acoustic songs as he tends to play only acoustic sets lately. I truly liked the set list, even the acoustic highlight “Heart of Gold”, but I also miss some of his best songs like: Rockin’ In A Free World” or “Like A Hurricane”. The encore of this really good performance is a cover of the Beatles song: “A Day In The Life”; Young still rules! Santana ended the second day of Bospop and besides his normal annoying preaching for love and peace this was an outstanding show although a lot of people missed “hits” like for example “Samba Pa Ti” or “Dance Sister Dance”. Carlos guitar solos however were out of this world although I can understand that some people found it too much guitar picking…. The opener “Jingo” got the crowd really going but then the band decided to play some rather “unknown” tracks and the crowd – not me by the way – seemed to get bored…. But with classic Santana songs like “Black Magic Woman’, “Oye Como Va” and some newer hits like “Maria, Maria” or “Smooth” Carlos and his band pleased the audience again. After almost two hours the show was over and lots of people were a bit disappointed but I really enjoyed Carlos’ magical guitar solos. The third day was the heaviest day of the festival featuring bands like Opeth, Thin Lizzy, Riverside, Anathema, Ted Nugent, Apocalyptica, Europe and ZZ Top! Lizzy with Scot Gorham and John Sykes gave the crowd what they came for, classic amazing hard rock. Especially songs like “Emerald”, “Sha La La”, “Jailbreak” and one of the best Lizzy songs ever “Black Rose” still give me gooseflesh, although I always miss Phil’s smooth, dark vocals…. Anathema played almost the same set as on 5 December in the Heineken Music Hall, when they were support for Porcupine Tree; however in some songs I missed the female vocal parts, but this band gets better and better every time I hear them! Danko Jones played loud and talked a lot of crap and his performance was not really my cup of tea.Riverside however proved again that they belong to the top of the prog metal world, especially the guitar solos of Piotr Grudzinski were again out of this world; musical highlight was: “Ultimate Trip”. Then it was time for something completely different, namely: Apocalyptica. Their “classical” music with cellos and drums has gained many fans all over the world. Again they played some Metallica covers, but most of the songs were own compositions, not bad, but after a while it starts to get a bit boring as the songs tend to sound-a-like too much. Opeth was definitely the loudest band of the entire festival and they were really LOUD!!! Unfortunately they did not play much of their latest album “Watershed”, so the set mainly consisted of very heavy, dark songs with lots of grunting and not much real singing from Mikael Akerfeldt. Furthermore I think that Opeth should do something about their stage presentation as nothing much happens during their show….. Still, I have to say that this year’s edition was a true musical highlight from the first day to the last! The weather was excellent – except for the rain on Friday – the audience was enthusiastic, the beer was good and the organisation was again perfect. So, I am looking forward to the 29th edition already!! 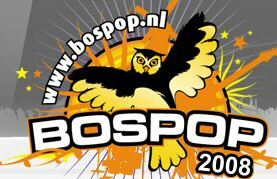 Bospop rules!